At higher pH than neutral, this equation is a more appropriate representation of the situation. However, since the concentrations of [H+] and [OH-] ions are related by the dissociation constant of water, these equations can be summarized in a Nernst equation. that becomes equation at 25oC and the hydrogen partial pressure of value unity. This equation and its alkaline or basic form, delineate the stability of water in a reducing environment and are represented in a graphical form by the sloping line (a) on the Pourbaix diagram shown below. 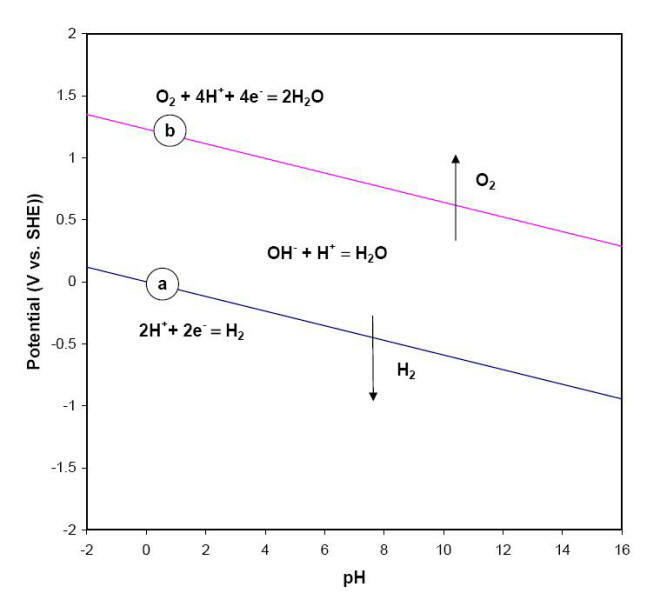 Below the equilibrium reaction shown as line (a) in this figure, the decomposition of H2O into hydrogen is favored while it is thermodynamically stable above the same line (a). As potential becomes more positive or noble, water can be decomposed into its other constituent, oxygen, as illustrated in equations and for respectively the acidic form and neutral or basic form of the same process. And again these equivalent equations can be used to develop a Nernst expression of the potential in standard conditions of temperature and oxygen partial pressure of value unity. The line labeled (b) in the previous Figure represents the behavior of E vs. pH for this last equation. The chemical behavior of water across all possible values of potential and pH is divided into three regions. In the upper region, water can be oxidized to produce oxygen while in the lower region it can be reduced to form hydrogen gas. Water is therefore only thermodynamically stable between lines (a) and (b). It is common practice to superimpose these two lines (a) and (b) on Pourbaix diagrams to mark the water stability boundaries. Some fuel cells operate by oxidizing hydrogen gas on an anode while reducing oxygen from ambient air in contact with a cathode. What would be the maximum voltage produced by such a cell running on pure hydrogen and air in an acidic environment? Would it be different if pure oxygen was used instead of ambient air?